Jason Kenney formalized the United Conservative Party’s climate change and energy plans on the weekend. There’s more to Kenney’s platform than the headlines about scrapping the carbon tax – the platform is a systematic walk-back of some of the most important climate change initiatives in Alberta, an effort to perpetuate myths about other initiatives and, I believe, a gift to those opposed to Alberta’s energy sector. In case you’re not aware, I have a personal tie to many of these policies: in 2015, I chaired Premier Notley’s Climate Leadership Panel that recommended many of them. I’ve also worked on policies federally under Prime Ministers Harper and Trudeau and provincially under Premiers Stelmach, Redford, Hancock, Prentice and Notley. I’ve written on these topics since before Alberta had its first carbon price introduced in 2007. So, if you want to take this as sour grapes about an opposition party proposing to unwind a policy I recommended, go ahead. But, before you do that, I hope you’ll take time to consider the arguments below. Alberta has had a carbon pricing plan in place since 2007. That policy, the Specified Gas Emitters Regulation (SGER), included both a carbon price and an allocation of free emissions credits to facilities in proportion to their production. Facilities paid an emissions tax on all emissions at $15 per tonne, net of emissions credits given per unit output at a rate equal to 12% below that facility’s historic emissions intensity. This meant that if you had higher historic emissions intensity than your competitors, you got more free emissions credits than they did. Think of the government writing giant novelty cheques and giving larger ones to facilities with higher historic emissions intensity and you might see the contradiction. Premier Notley introduced three changes to this policy. The carbon price was increased from $15 per tonne to $20 per tonne in 2016 and $30 per tonne in 2017, along with a decrease in the number of free emissions credits allocated from 88% of historic emissions intensity to 80%. Next, as part of the Climate Leadership Plan that I helped design, these credit allocations transitioned to ones based on sector-level benchmarks rather than facility-specific history starting in 2018. This latter change meant, for example, that all electricity producers would get the same number of free emissions credits per unit of electricity produced. Kenney’s plan would partially unwind these policy changes, but would also introduce some positive elements that were not present in Stelmach’s initial plan. Kenney’s plan would grant free emissions credits to facilities at a rate equal to 90% of their 2016-2018 average emissions intensity, and reduce the price on carbon from $30 to $20 per tonne. Facilities would continue to be able to trade or bank credits and would be able to buy offsets from activities like no-till agriculture or otherwise-unsubsidized renewable power generation within Alberta. Importantly, unlike the Stelmach-era policy, Kenney’s policy commits to reduce the allocation of credits to facilities by 1% per year, which will be important in the future to ensure that the market isn’t swamped with credits. So, what does this do? Compared to the policy in place today, it provides a larger subsidy (think giant, novelty cheque) to our most emissions-intensive output, provides a smaller output subsidy (novelty cheque) to our least emissions-intensive output and decreases by one third the value of process innovations or direct emissions reduction activity like no-till farming. If you’re interested in reducing emissions, these are all bad things. It also could, depending on how new facilities are assessed, dramatically reduce or negate the value of innovation at the facility design phase, which would also be bad. That’s a lot of jargon, so let’s look at a picture. The graphic below shows an approximation of what the change from the CCIR to the Kenney plan would do for existing oil sands facilities. As you can see, the CCIR creates a strong link between emissions intensity and costs, with facilities with low emissions per barrel earning additional cash flow from selling credits. The proposed UCP approach levels the playing field with similar costs for facilities regardless of their emissions intensity. Jason Kenney’s plan would save the highest-emissions oil sands facilities in the province up to $5 per barrel, while costing the lowest-emissions facilities up to 60 cents per barrel. On average, it would save producers 60 cents per barrel compared to the current policy. It would also mean that an innovation which reduced oil sands emissions intensity at any of these sites would be worth only two thirds as much as it is today, and there would be less incentive to design a site with new, but perhaps more risky emissions-reducing technology. On a positive note, the Kenney plan keeps the good-as-best gas benchmark approach from Notley’s CCIR plan for electricity. This, in contrast to the Trudeau government backstop or the previous Stelmach-era policy, means that we won’t have a policy which directly subsidizes coal power in Alberta with more free emissions credits than are granted to natural gas or renewable power. Of course, one might wonder why, if this approach works for power, it doesn’t work for other sectors like the oil sands. The headline item of Kenney’s climate plan is the removal of the economy-wide carbon price. The carbon levy prices emissions from those sources not associated with large, industrial facilities: homes, small businesses, cars, trucks and buses, as well as some on-farm emissions. A broad-based carbon price will lower emissions at the lowest cost to the economy – we’ve heard economists say this forever. In addition to this, I’d argue that a key reason why it is in Alberta’s interest both to have and to advocate for Canada to have economy-wide carbon pricing is that it puts all sources of emissions on a level playing field. Imagine if Prime Minister Trudeau were standing up today calling for really tough policies on oil sands, gas processing, and other large industrial facilities while exempting the cars driving through his own riding on the Autoroute Metropolitaine in Montreal. “Polluters, not commuters,” he might say. An Alberta premier worth their salt would see that policy for what it was: a disproportionate attack on Alberta industry and an exemption for vote-rich urban areas. 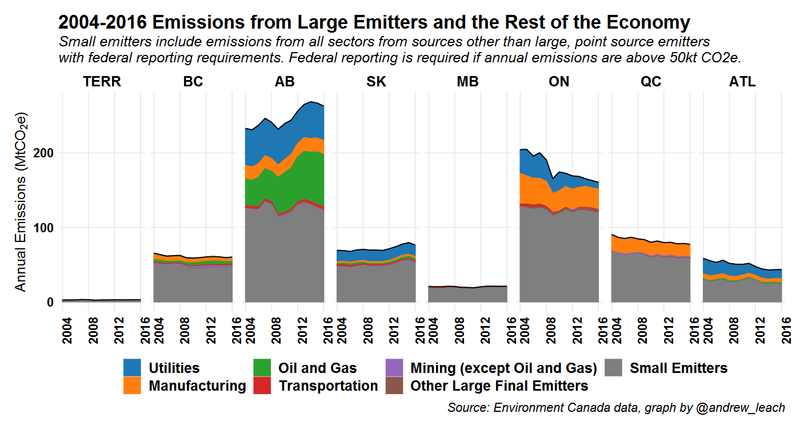 If you look at the graphic below, it shows where emissions from large, industrial facilities occur across Canada. I’d suggest that any Alberta emissions policy should be one which we’d still like if the federal government adopted it as its means to meet our national targets. This policy approach fails that test. It’s also worth noting what Kenney’s plan doesn’t highlight – the removal of spending initiatives tied to the carbon price, in particular the so-called rebate. Since the rebates were tied to income, not actual expenditures related to the carbon price, removing these rebates represents a significant loss of purchasing power for lower-income Albertans while removing the carbon price benefits higher-income Albertans more on average since they tend to spend more on covered items. In their platform, the UCP cited very interesting work by Trevor Tombe and Jennifer Winter at the University of Calgary. That work shows that, “nearly 40% of Alberta families have carbon tax credits that exceed carbon tax costs (and that) of those with incomes below $60,000, over 70% have credits that exceed costs.” In other words, if you remove the carbon tax and the rebates, you’ve made 40% of Albertans and 70% of those with incomes below $60,000 per year worse off by an average (among that 70%) of $143 per year. That’s a big change. The UCP also pledges to remove constraints on coal power and oil sands emissions as well as discontinuing support for renewable power. The removal of the oil sands and coal power constraints simplifies policy within Alberta, but in both cases at a cost of some currency outside of Alberta. 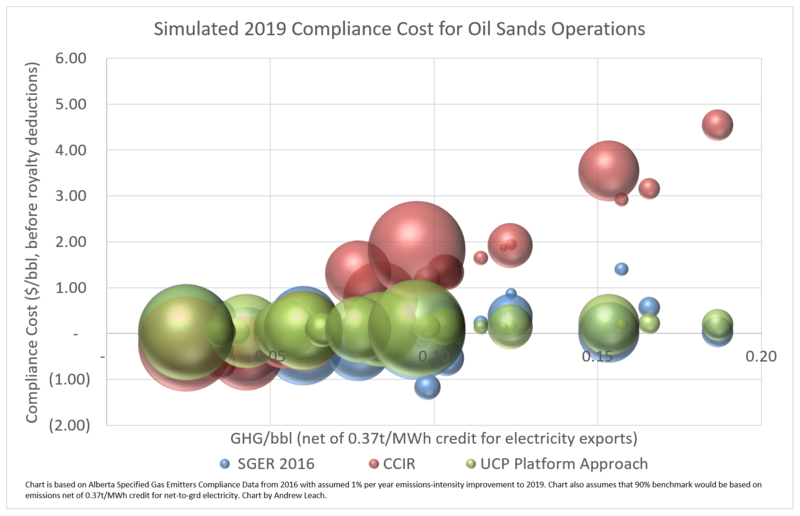 The oil sands emissions cap, at a level the oil sands will only hit if you’re really bullish on oil and really bearish on technology, was complex and unlikely to be easily regulated. Regardless, it was listed as one of the key reasons that Prime Minister Trudeau approved the TransMoutain pipeline. The coal phase out, I think, was more useful. It, perhaps, accelerated Alberta’s off-coal date by a few years but, for the majority of our coal facilities, the combination of low-cost variable renewables, cheap natural gas, tightening air quality regulations and (yes, even under the UCP policy) a big carbon price disadvantage was going to spell their demise regardless. In return for allowing those plants to run a bit longer, Alberta will lose our strongest international argument: that if, like Alberta, the world phased out coal power by 2030 we’d be well on our way to reaching global goals. Jason Kenney’s war room might find that it’s harder to argue that the real issue is not our oil sands but coal power in China, India and the rest of the world if he’s not willing to consider phasing out coal power at home. There is nothing more fun than asking anyone from Germany why they can’t phase out coal-fired power by 2030 like Alberta is doing. Removing supports for renewable power was not unexpected. The plan pledges to, “end costly subsidies after the Renewable Energy Program’s round 3.” While the UCP may enjoy perpetuating the myth that renewable supports have been costly, that’s not the case in Alberta. The Renewable Energy Program has been a success beyond what I would have imagined, in the sense that the cost of procured renewable power has been incredibly low – well below our historic average costs of power and much cheaper than the dreaded Ontario feed-in tariff programs. In January 2017, Ontario’s feed-in tariff was offering $125/MWh contracts for wind power. By contrast, Alberta’s REP programs have procured almost 1400 MW of new wind capacity, with average procurement costs of less than $40/MWh. With the carbon price remaining in place in the power sector under the Kenney plan, there would still be a significant (~7.50/MWh or greater) cost advantage for renewables over fossil fuel generators and with continued cost decreases, we should expect to see commercial deployment of more capacity in this space. While I’d take issue with the framing of costly subsidies, the UCP policy does provide an economic environment where renewables can compete for market share and the industry should be mature enough in Alberta to do so. Not to be forgotten in Kenney’s plan is the proposal for a $30 million program to fight for Alberta resources – Kenney would, we’re told, tell the truth about how Albertans produce energy with the world’s highest environmental standards. The thing is, with the changes he’s proposing to our environmental policies, we would not even have the highest environmental standards among Canadian provinces, at least insofar as our greenhouse gas emissions are concerned. It’s more than that, though. There’s a sustained campaign to convince Canadians and the world that Alberta’s energy sector is not compatible with action on climate change. This weekend, they got a big helping hand: Alberta’s prospective premier told them as much in his official platform. Perhaps that’s not the most tactical approach. Wasn’t the carbon tax $20 per tonne in 2017 and then increased to $30 per tonne in 2018? carbon levy, yes. CCIR was different. This is a good article Andrew. And as usual, your analysis is very good. I do take exception to your criticisms of the SGER policy. I was a lead architect in designing SGER so I am particularly sensitive to this criticism. SGER was the first climate policy regime in the Western Hemisphere so it was a bold move at that time. We convinced the government, with the support of the petroleum and power sectors, that we needed to price the industrial emissions of CO2. The Government agreed, on the condition that we keep the potential annual economic and competitive impact on the provincial economy below a specific dollar figure. We designed a policy regime that did that. The program was announced as a first step and subsequent steps would be taken to make it more stringent when and if our competitors and neighboring provinces followed suit. There were no “novelty cheques”. The baseline prior to SGER was that emitting CO2 to the atmosphere was a free good. SGER imposed a price on a portion of something that had been free. The program cost industry money and that money was used to incentivize industry to deploy technologies and practices that would reduce their emissions. It is very wrong-headed and inaccurate to describe it as you have done. If you want to continue to use this term, perhaps you should begin by explaining that prior to SGER, all emitters were getting big novelty cheques because they were allowed to emit all the CO2 they wanted. The same was being done in every jurisdiction in the Western Hemisphere — every jurisdiction issues big ‘novelty cheques’. Then the Government of Alberta took the bold and risky step to the competitiveness of its emitting industries by reducing the size of the ‘novelty cheques’ that it was writing while no other competing jurisdiction reduced theirs. The update that you and your committee recommended to the Government of Alberta was, I believe, consistent with the initial Alberta plan to take a second step after our competitors started to regulate their own CO2 emissions. I commend you for doing so. It was a good change at a time when the competitive and political situation was ready for it. It is hard for me to understand how Kinney’s UCP proposal would be good for Alberta and our economy. Alberta’s petroleum and power sectors emit about 2/3s of Alberta’s GHGs and they demanded the Alberta Government (Klein’s PC Government at that time) impose a price on our GHGs to make Alberta’s energy exports acceptable and competitive in our export markets. If Alberta had not implemented a price on carbon in 2007, Alberta’s energy exports, employment, and economy would have been worse that it is now. If we hadn’t priced carbon emissions when we did, some of the jurisdictions that have been buying our energy would have followed through on their threats to boycott our energy. I agree that SGER was revolutionary, but the fact remains that the OBAs as a function of historic emissions intensity provide a larger value per unit output to plants with more emissions intensity. I suppose one can view it as fair to regulate a common reduction, but I see it as providing more free emissions credits per unit output (or a more generous allowance of unpriced emissions, if you prefer). One can, and I have, talked about how to improve the SGER without disparaging it, and that’s true here. The novelty cheques analogy is to get people to think about the value of unpriced emissions or OBAs and how they are allocated. I appreciate this analysis as it has helped answer some of the questions I have had about the new CCIR with respect to carbon pricing. However, I am disappointed to see the “good-as-best gas benchmark approach” framed in a positive light. Allowing natural gas and coal plants to emit carbon while paying partial or no carbon taxes is a subsidy to fossil fuel electricity generation. In particular, under the UCP and in the absence of any government supports (rebates or long term contracts) for renewables and a discounted carbon tax for fossil fuel generation, we once again have government firmly putting their thumbs on the scales of the market in favour of non-renewables. Not in the Alberta context, since renewables and non-renewables get the same OBAs. It’s not tipping the scales at all. 1) Shepard (best gas) to my understanding is paying no carbon tax for burning natural gas and emitting into our atmosphere. To my understanding, I pay more carbon tax $ to heat my home. Correct? 2) Innogy 57MWp project selling energy to the merchant market (no contract for energy or offsets). Are you saying it is a level playing field because the Innogy project can sell its offsets to other large emitters? And if so, how is it a level playing field if shepard is paying $0 for its emissions?